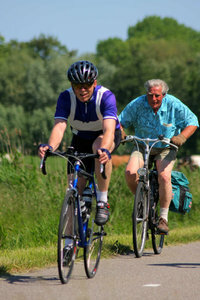 Every year there's a biking event at Whitsun in Friesland (the Netherlands), attending the 11 cities. A journey of 210 kilometers. I thought this picture gave a nice contrast between the young guy on his racing bike and the older man on his regular bike. If you wanna use my pictures, please send me a link or a PDF of the publication. An additional comment would be welcome! Thnx so much!! This photo will be used on outdoorseagle.com. Thank you.